May 6, 1942: A gloomy day in history when the combined force of the United States' armed forces and Filipinos, abandoned by the US led by president Roosevelt (the Europe-first policy), without food, ammunition, medicines; with gangrened bodies piled up, capitulated almost a month after the Bataan peninsula gave up the gallant fight; a heroic fight that delayed Japanese timetable of occupation to the point of saving Australia from the Japanese juggernaut. By this time, much of East Asia already fell under the shadow of the Land of the Rising Sun except Thailand who collaborated with the Nihon-jin invaders. Great picture Tutubi. I've never been to Corregidor... tsk, tsk! Hmmm... interesting to know what your Japanese friends thought when you went to Corregidor. at part pala ng cavite ang corregidor. strange! pano nangyari yun? Never knew it was so nice. 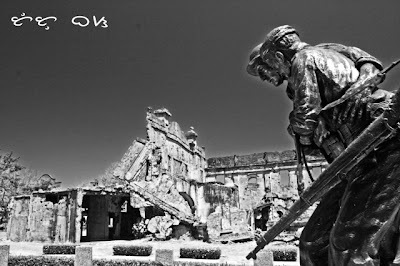 I missed Corregidor when I was at Pinas. I heard it's beautiful though! Last I was in Corregidor was when I was in high school. Maybe I'll join Carlos' overnight trip.